Texan Jim Hall began racing sportscars in SCCA events in the early ’50s. He became pretty good at it. In 1957 he moved from Dallas to Midland to be closer to his family’s oil business. There he joined a syndicate that built and ran a sportscar track called Rattlesmake Raceway. It was never very good as a racing facility, so when Hall formed Chaparral in the early ’60s, he acquired the track as a private test facility and built his factory there. Hours of Daytona and the 12 Hours of Sebring. From 1963-1965, Chaparrals driven by Hall and Hap Sharp, dominated SCCA racing. Chaparral was well known for aerodynamic innovations. Hall was one of the first to put “air-dams” under a car’s chin to keep the front of the car on the ground. He was also one of the first to put a “spoiler” on the rear deck edge to keep the back end on the ground. When the Can-Am was formed in 1966, Chaparral joined in. In 1966, Hall shocked the racing community by mounting an inverted wing on two vertical struts on the back of his Chaparral 2E cars. Working like an airplane wing, only upside down, it generated downforce (instead of lift) to increase rear traction, preventing oversteer in corners. The radiators were relocated from the front of the car to the sides, which reduced cockpit temperatures and allowed a second wing to be mounted inside the front bodywork to keep the front of the car stuck to the road. Jim Hall teamed with Phil Hill, who had become the first American to win the Formula One World Driving Championship in 1961, to drive Chaparrals in 1966. Chaparrals set fastest qualifying time twice that season (Hall once and Hill once) and Hill gained the team’s first Can-Am win on October 16, 1966, at Laguna Seca, California. The team only entered one car for ’67, with Hall at the wheel. They managed neither a pole position (fastest qualifier) nor any wins. Their best finishes were a pair of seconds. Hall had planned on running his new, 2H in 1968, but development bugs kept it from debuting until 1969. He would be forced to race the 2G in 1968. The result was one pole but no wins. Las Vegas, the sixth and final race of the season, was also the last race as a driver for Jim Hall. Late in the race, his Chaparral collided with a backmarker, was launched into the air, and landed upside down. Hall was rescued from the ensuing fire, but his severely broken legs lead to his retirement from driving. Although introduced by Jim Hall in 1966, not many cars besides the Chaparrals used high wings for extra downforce. 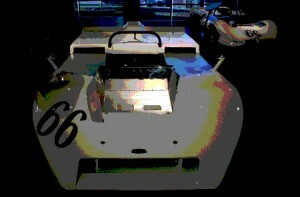 Several cars carried them in 1969, but Hall himself introduced another radical car, the previously mentioned Chaparral 2H. Dubbed “The Great White Whale”, because it looked like one, it would not be one of Hall’s better efforts. It was originally designed as a narrow coupe with windows in the doors because the driver sat so low in the body. Driver John Surtees felt that visibility was poor and had Hall take the car’s canopy off and raise the driver’s seat. The vestigial passenger seat remained under the bodywork. There was a low wing at the back of the body. This Chaparral didn’t cut it. The team bought a McLaren M12 to use while they continued to sort the 2H out. At one point in the season, the 2H wore a huge wing in the center of the car with the struts mounted to the sides of the car. Quite possibly, the most bizarre looking racer ever built. Although Hall and Surtees never got along well, Hall took full responsibility for the failure. He felt that had he not broken his legs, which kept him from test driving, he could have sorted the car out. At any rate, the team’s direction changed for 1970. The FIA, auto racing’s world ruling body, outlawed tall wings (from now on they would have to be near the bodywork) after 1969 because of some spectacular accidents that had occurred to F1 racers. Also, “movable” aerodynamic devices such as Chaparral’s flipper wings were outlawed. Jim Hall’s answer to this, the Chaparral 2J, did not debut until the third race of the 1970 Can-Am season in July at Watkins Glen, New York. The 2J was as radical as the 2E and 2H had been. Maybe more so. The car looked like a white brick. A very fast white brick. The car carried two motors. A 465 cubic inch Chevy V8 powered the rear wheels and a 274 cc Rockwell snowmobile engine powered a pair of “sucker” fans in the rear bodywork. The fans sucked air out from under the car, creating a vacuum that held the 2J on the track. Sliding Lexan skirts were placed around the bottom edge of the body to seal the “plenum” area under the car. Enough suction could be generated to hold the car upside down on the ceiling of a room! Where a wing generates downforce (good) it also generates drag (bad). The suction device generated downforce with no drag loss. Elford was fastest qualifier in all three of those races but he only finished one (sixth at Road Atlanta). Something always broke. But the competition felt that, with a year of experience under their belt, the Chaparral team would bury them in 1971. Competitors were always lobbying the SCCA to ban the 2J. At the end of the season it was. The sliding Lexan skirts were said to have violated the “moveable aerodynamic device” ban. With that, Jim Hall closed up shop. An era in international autoracing had come to a close. Hall did return to autoracing in 1980 with the Chaparral 2K Indycar. Johnny Rutherford won the Indy 500 that year in the car. Hall owned a CART Indycar team into the 1990s, but bought his team’s chassis from other companies. In 2004, the Petroleum Museum in Midland, Texas, opened the Chaparral Gallery, a permanent home for the surviving Chaparrals. Photos from the grand opening of the museum, including the Chaparral Cars work shops and Rattlesnake Raceway, can be found via this link at Motorsport.com.